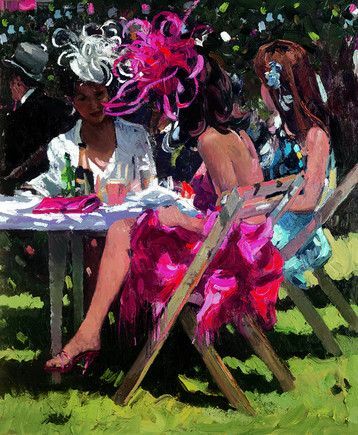 Sherree Valentine Daines – art of the British social calendar! We thought we would start with some general background on Sherree as this is our first of many posts about this most celebrated of English artists. This remarkable lady celebrated her 30th anniversary as an artist in 2007 by publishing her first art book ‘First Impressions.’ Having had a remarkable career so far, producing nearly 150 different limited edition prints and canvas titles, she certainly shows no sign of slowing down her pace as a published artist! Sherree has been televised on numerous occasions, including ‘This Morning’ on ITV with Fern Britton and has won many awards; remarkably she found time to teach ‘life art’ classes for twenty years, run a gallery & be a housewife and mother to her husband and four children! She is well known for her figurative and impressionistic art work by the art community & has exhibited at prestigious galleries such as Tate gallery, The Barbican, The New English Art Club and The Lords Museum. 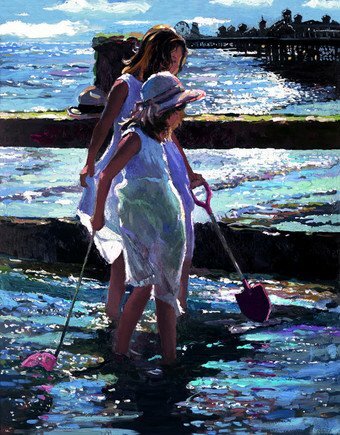 Recently an art critic described her as “The face of modern British Impressionism” and shortly after Sherree was voted the UK’s leading impressionist artist. 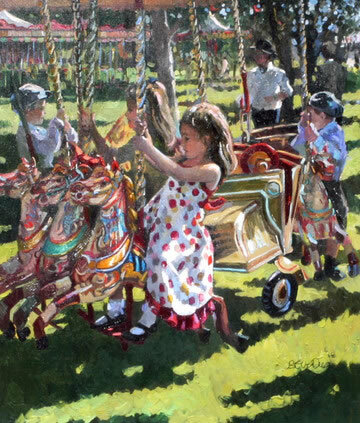 Other awards she has received include The Laing Landscape and Seascape Competition and The Young Artist of the year award from the Royal Portrait Society. Renoir and Monet influence can be seen in her work, her focus on light and shadow especially. Her interest in Impressionism and Figuratism maybe attributed to her love of ‘people watching’ & then capturing their emotions and behaviour onto canvas. Sherree also experimented with many mediums while studying her art degree but decided that oil was her favourite because of the richness and texture the paint gave her work.